Netanyahu mocks Ehud Barak after he compares Netanyahu and his wife to King Louis XVI and Marie Antoinette. Prime Minister Binyamin Netanyahu on Tuesday mocked former Prime Minister Ehud Barak, who served as Defense Minister in Netanyahu's second government. Netanyahu was responding to a tweet reportedly published by Barak, in which Barak implied he was making a comparison between Netanyahu and his wife and French King Louis XVI and Queen Marie Antoinette. "When the allegations of corruption came, he said: ‘There will be nothing because there was nothing’, and his wife said: ‘If they do not have bread, let them eat cakes.’ It did not help them on Judgment Day," Barak had tweeted and attached and a picture of a famous painting depicting the execution of King Louis XVI and Marie Antoinette. 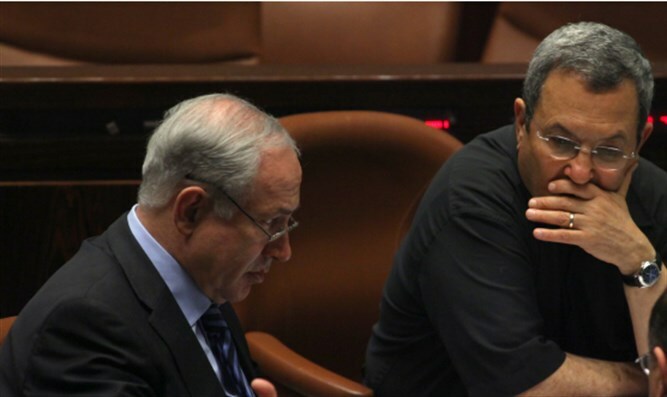 "Okay, it looks like Ehud Barak has lost it," Netanyahu tweeted in response to Barak. Barak removed the tweet in question within a few minutes, after it angered many users who attacked him for it. Barak has consistently criticized Netanyahu in recent months. While many believe he is doing this as he prepares to return to politics, Barak has insisted he has no plans to return to politics at this time. Among other things, the former prime minister recently accused the government of leading towards a reality of one state with an Arab majority.